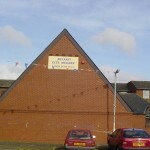 The Belfast City Mission has had a presence in the Mountcollyer district for 152 years. It is one of the oldest works within the Mission still existing. The work commenced in 1867 in the home of Miss Fanny Hunter located in Weaver Street. Soon the work outgrew her home and the Mission opened a new hall in Milewater Street. The steady progress in the work was maintained here until February 1897 when the Mission acquired new premises (gifted from the John Getty Bequest) at the corner of Mountcollyer Avenue and North Queen Street. This remains the current location for the continuing work. Throughout these many years there have been many Missionaries who have served faithfully. Mr James Bell 1897-1922, Mr James Mateer 1922-1944, Mr J Lewis Warke 1944-1965, Mr W J Heatherington 1965-1986, Mr Raymond McLarnin 1987-1992, Mr Jackie Spence 1992-1994. Mr Brian Smyth joined the staff of the Mission on 1st July 1994. This was a difficult period for the Mission as only a small number were attending. However, Mr Smyth worked hard on evangelising the district and soon he started to see an increase in attendance. However, another serious problem was discovered with the structure of the hall as dry rot had set in with intensity. The Mission was faced with a dilemma of closing the hall or carry out major refurbishment. The latter was decided upon but there was the problem of finance. Much time was spent in prayer and God wonderfully answered those prayers. The Mission received an anonymous gift of over fifty thousand pounds towards the refurbishment of the Mountcollyer hall. 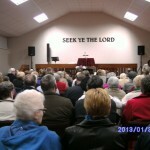 After a period of closure with the work continuing in homes, a Community Centre and in Newington Presbyterian Church, the hall was re-opened on 9th March 1996. Mr Smyth subsequently resigned from the Mission on 30th June 2000 to go for training to Kilzimmer in Switzerland with Child Evangelism Fellowship. Mr Raymond Hume who had worked in Fairview Road Ballyduff for a number of years moved to the Mountcollyer district until his retirement from the Mission in October 2011 after 23 years of faithful service, 11 of those spent in Mountcollyer. The present Missionary Mr Walter Simms was appointed to the Mission in March 2010 and spent a short time in Rathcoole before transferring to Mountcollyer to work alongside Raymond before taking up duties for Mountcollyer hall. The 21st Century has brought many changes to many areas of the City and the Mountcollyer district has experienced many of them. 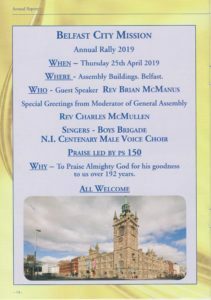 The Belfast City Mission Mountcollyer maintains a presence here and its aim remains the same today, to reach into the community at large with the message of hope in the Gospel of Christ Jesus.